In 2017, 7% of criminal incidents in Canada were classified as unfounded and the proportion of sexual assaults classified as unfounded declined from 2016. One in seven sexual assaults reported to police in 2017 was classified as unfounded, meaning that police determined that no crime had taken place, compared with one in five sexual assaults in 2016. At the same time, the number of founded sexual assaults reported by police rose in 2017. Ongoing public discussions around sexual misconduct and sexual violence in both the news media and on social media in 2017 likely had an impact on the number of sexual assaults reported to police in late 2017. Additionally, several police agencies across Canada announced in 2017 that they would review their unfounded sexual assault cases to determine whether further investigation was required. At the same time, Statistics Canada has worked with the policing community to address data quality issues and ensure standardized reporting among police services. The Juristat article "Unfounded criminal incidents in Canada, 2017" and the accompanying infographic "Unfounded Sexual Assaults in Canada, 2017," released today, present an overview of rates of all unfounded criminal incidents, with a particular focus on sexual assaults. The article is the first release of information on unfounded criminal incidents since Statistics Canada resumed collection and release of these data through the Uniform Crime Reporting (UCR) Survey. Substantive work undertaken by Statistics Canada with police and other partners is documented in the article "Revising the classification of founded and unfounded criminal incidents in the Uniform Crime Reporting Survey" and the accompanying infographic "Unfounded criminal incidents: Statistics Canada's path to new data collection." Crime indicators for the provinces, territories and police services are available in the new interactive product, "Canadian Community Crime Tracker." This tracker includes rates of sexual assault and the proportion that were reported as unfounded. In 2017, 14% of sexual assaults (levels 1, 2, and 3) reported to police were classified as unfounded, down from 19% in 2016. In all, about 3,900 incidents of sexual assault reported to police in 2017 were deemed to be unfounded. 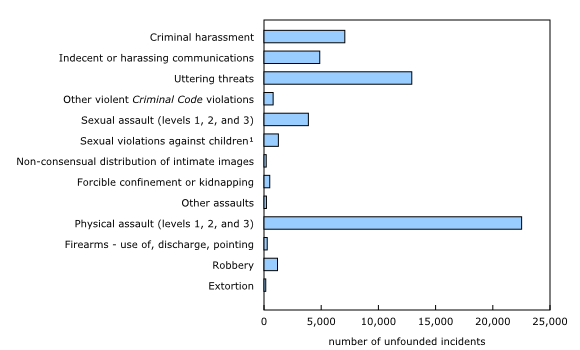 In the Criminal Code, sexual assaults are classified into three separate categories depending on the nature and severity of the incident, with level 2 representing sexual assaults that involve weapons, bodily harm or threats of bodily harm, and level 3 representing those that wound, maim, disfigure, or endanger the life of the victim. More severe sexual assaults (levels 2 and 3) were less likely to be deemed unfounded (7% and 9%, respectively) than were level 1 sexual assaults (14%), that is, violations of a sexual nature that did not involve weapons or evidence of bodily harm, such as unwanted touching or other non-consensual sexual contact. In comparison, the proportion of physical assaults classified as unfounded also decreased over this period, though to a lesser extent, from 11% to 9%. As with sexual assaults, a higher proportion of level 1 physical assaults (common assault) were classified as unfounded (11%) when compared with level 2 (involving a weapon or bodily harm) (3%) and level 3 (aggravated assault) (1%). Sexual assault is one of the crimes least likely to be reported to police, yet the number of reported incidents rose in 2017, particularly following the height of social media campaigns that raised awareness of the issue. According to the most recent General Social Survey on Victimization, 5% of sexual assault incidents in 2014 were brought to the attention of police. Since these incidents typically go unreported, any changes in reporting behaviour are likely to have a measureable impact on the number of police-reported incidents. 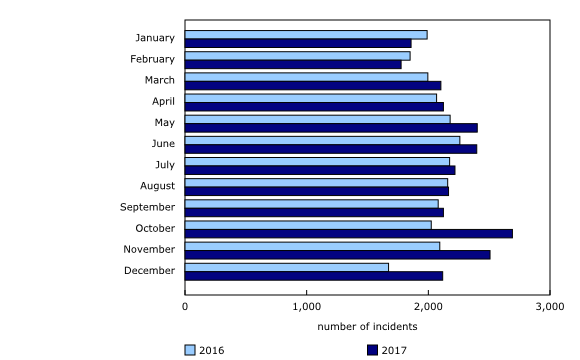 While the number and proportion of unfounded incidents decreased from 2016 to 2017, overall reporting of sexual assaults to police increased. In 2017, there were 28,551 incidents of sexual assault reported to the police, of which 24,672 were deemed founded; that is, police determined that a crime had taken place. The rate of founded sexual assault increased 13% from 2016, to 67 incidents per 100,000 population in 2017. Compared with 2016, the largest increases in the number of reported sexual assaults (including founded and unfounded) were in October, November and December 2017. Many social media campaigns surrounding awareness of sexual misconduct and sexual violence, such as #MeToo, went viral in October 2017 and continue to garner public attention. The proportion of sexual assaults classified as unfounded varied across the provinces and territories in 2017, ranging from 10% of all reported sexual assaults in Quebec, to 24% in Prince Edward Island. 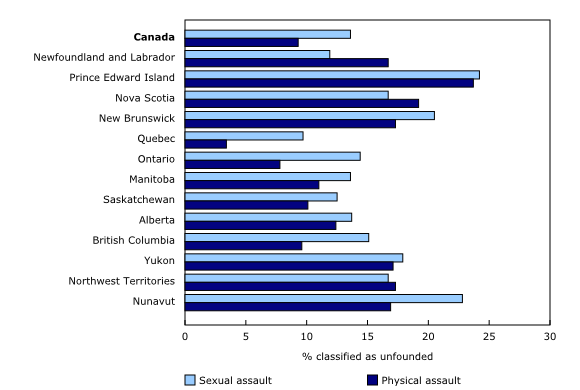 In terms of physical assault, Quebec (3%) and Prince Edward Island (24%) also reported the lowest and highest proportions of unfounded incidents, respectively. In 2017, there were just over 2.1 million criminal incidents reported to police, of which about 152,000, or 7%, were classified as unfounded. When considering all violent incidents reported to the police in 2017, more than 1 in 10 was classified as unfounded (12%). In comparison, 6% of property crimes and 7% of other Criminal Code-related incidents were deemed unfounded. That said, some property offences, like arson (14%) and motor vehicle theft (10%), were more commonly classified as unfounded relative to other property crimes. 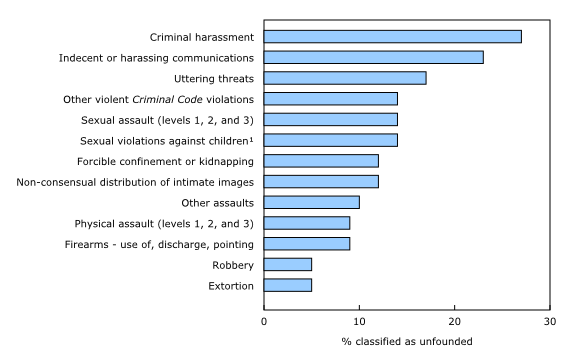 Overall, certain violent offences were more likely to be classified as unfounded by police, such as criminal harassment (27%), indecent or harassing communications (23%) and uttering threats (17%). In contrast, a lower proportion of incidents of robbery (5%) and extortion (5%) were deemed unfounded. Unfounded criminal incidents followed the same trend as crime in general, with the highest-volume offences representing the largest number of unfounded incidents. For example, level 1 physical assault, the most common type of violent crime, also accounted for the highest volume of unfounded criminal incidents in 2017 among violent crimes. In 2017, sexual assault (levels 1, 2, and 3) represented 7% of all unfounded violent criminal incidents and 6% of all founded incidents of violent crime reported to police. When the Uniform Crime Reporting (UCR) Survey was launched in 1962 to measure police-reported crime in Canada, counts of unfounded criminal incidents were collected in order to produce statistics on these types of incidents. Over time, however, inconsistent reporting of unfounded incidents led to poor data quality. Prior to this release, the last time rates of unfounded sexual assault were published was in July 2003. Prior to 2018, an incident was defined as unfounded if it was "determined through police investigation that the offence reported did not occur, nor was it attempted." The definition was updated in January 2018 to read: "An incident is founded if, after police investigation, it has been determined that the reported offence did occur or was attempted (even if the charged/suspect chargeable is unknown) or there is no credible evidence to confirm that the reported incident did not take place. This includes third party reports that fit these criteria." It is important to note that the data for 2016 and 2017 do not follow the new standards for founded and unfounded criminal incidents, as they have not yet been fully adopted. Though work was done by police services to review their unfounded cases, 2017 data may still be subject to inconsistent reporting and may therefore be incomparable across police services. In addition, UCR data cannot determine what impact, if any, police service reviews may have had. However, in light of police services conducting reviews and in order to establish a baseline for data collection and analysis moving forward, the 2017 data on unfounded criminal incidents are now available. It is expected that the data quality will improve over time as police services implement the new standards and receive training. This will occur throughout 2018 and it is anticipated that 2019 will be the first year of complete data. For information on all types of police-reported crime in 2017, see "Police-reported crime statistics in Canada, 2017." The article "Unfounded criminal incidents in Canada, 2017" is now available as part of the publication Juristat (Catalogue number85-002-X). The infographic "Unfounded Sexual Assaults in Canada, 2017" (Catalogue number11-627-M) is also released today.